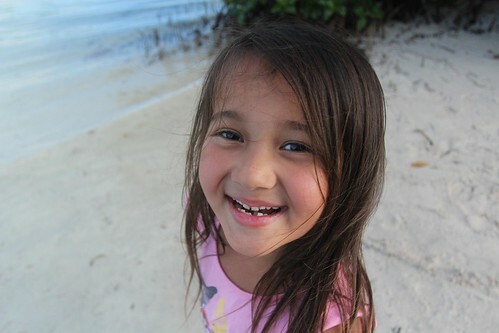 Mali Mish - Day 146: Leaving Long Key for Curry Hammock. 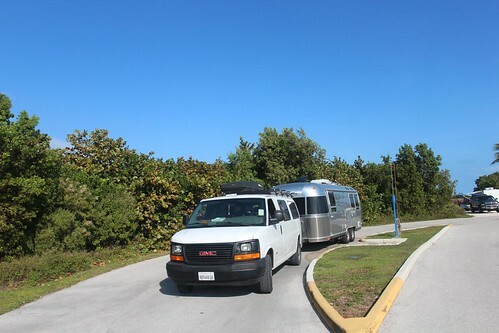 We would have preferred to stay longer at Long Key but our site is being taken over by an incoming camp host today. That means our stay will be cut short at 11 days instead of the 14 days that is allowed at maximum. As of a few days ago, we had 4 days between our stay here and Curry Hammock that is unaccounted for reservation-wise. 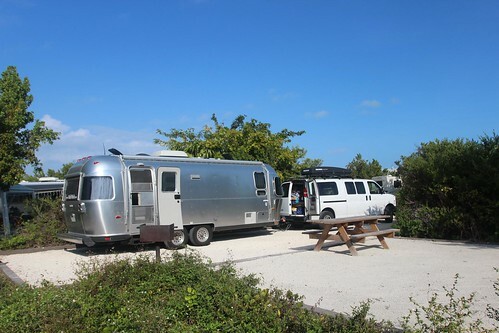 Luckily for us, a cancellation popped up over there and we were able to grab yet another last minute reservation at one of the 4 very coveted state park campgrounds here in the keys. Our 11-day stay meant that we had tons of gear to put away. This is the longest stay we have had during this trip and it was time and money well spent. We had chairs, rugs, tents, awnings, toys and every other thing imaginable spread across this waterfront site. You never know when a problem with RV keys may blow up. This makes it an excellent idea to put a phone number for an auto service on your speed dial. As of a couple of days ago, I started putting away the non-essentials to make our morning a little less hectic. As I was hitching up the Mish and putting away the hoses and cords, more than 1 person came by to ask me if I was leaving today in hopes that they can get in on this walk-up site. 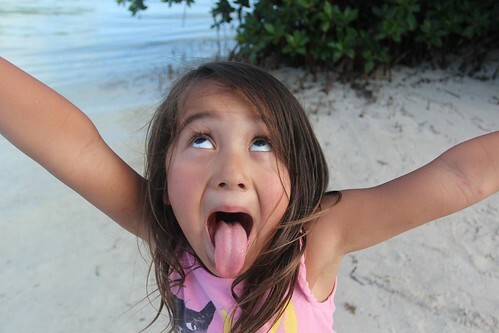 Apparently the ranger at the gate has been telling people that our site might be vacant when we leave. I suppose the camp host situation might have changed and maybe we would have been able to stay 3 more days but at this point, we are committed to leave. And wouldn’t you know it, the moment we are about to leave a campsite, Ava makes a friend and braves the water alone without one of us. For the last 11 days at the same site, she did not make friends with any of our neighbors except for our Instagram friends from Naples. Checkout time is 1pm and we made our stay here last until the very last moment. We headed back to the post office in Layton to check on one of our letters that is suppose to be arriving before making the 11 mile drive down to Curry Hammock. For no apparent reason, no one was there and the doors were locked. I guess even the post office runs on island time. 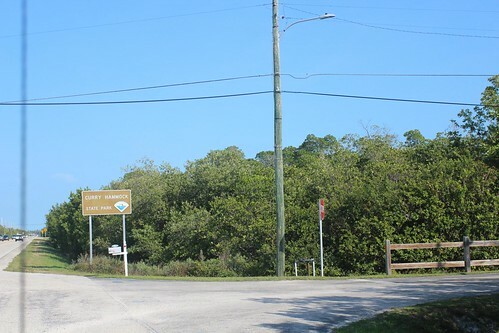 Curry Hammock is the newest of the 4 state parks with campgrounds here. We have never stayed here before but we have been hearing nice things. It is very small with only 25 sites. There are at least 2 camp hosts here plus at least 1 other site used as walk-up. That means there are really only 22 sites that are reservable online. 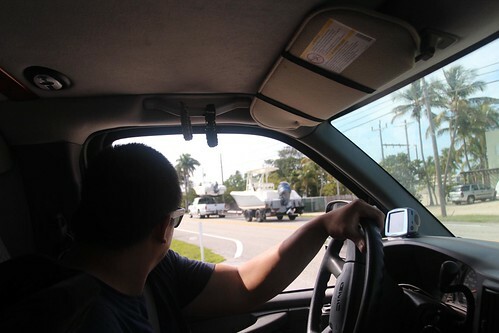 In those 11 days at Long Key, we found the limits of our holding tanks and we used every trick in the book to make them last so I wouldn’t have to hitch up for a mid-stay waste dump. That means washing dishes outside, pouring gray water into the black tank, using the campground bathroom as much as possible, etc.. With 5 of us, that still meant we had full tanks when we arrived at Curry Hammock. The campground here is only a few years old. 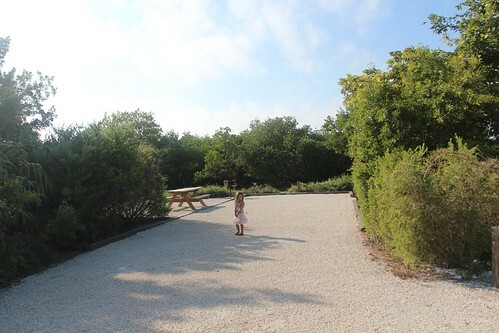 Every site is beautifully manicured and they have their own BBQ grills and new picnic tables. Although I can already tell that there will be more bugs here than Long Key. Just like Bahia Honda, there is not as much breeze that blows through here. Also the grounds are hard and gravelly which means water also does not permeate as easily through so puddles can form to make breeding grounds for mosquitoes and no-see-ums. We will be here for 8 days total with our nights evenly split between 2 sites. This is site number 7. 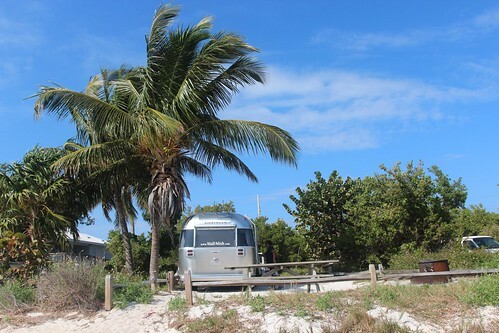 It is right along the outer edge of the campground with a short pathway down to the beach. We have a rather large area right next to us as compared to most of the other sites. Site 8 right next to us happens to be a camp host site. 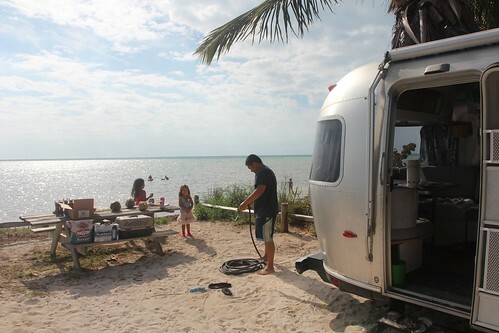 You can barely see the AC unit on top of their camper to the left of the photo but it is indeed another 25 ft Airstream. 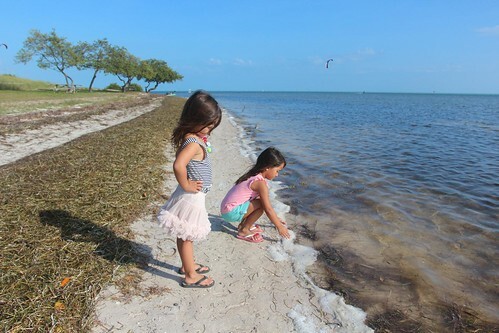 The water at Curry Hammock is a little murkier than Long Key which made the girls even less inclined to take a dip. 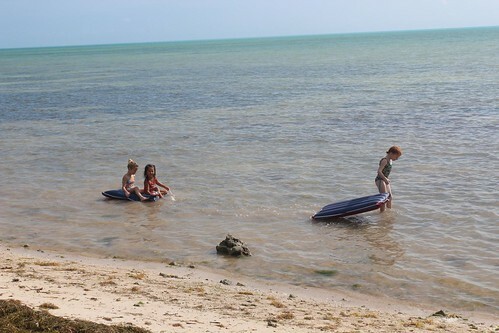 Just like Long Key, there is a bed of seaweed at the high water mark. As compared to commercial parks, state parks do not spray for bugs and certainly will not remove the seaweed from the shore. They are all part of the ecosystem that they are trying to protect so our future generations can continue to enjoy them. 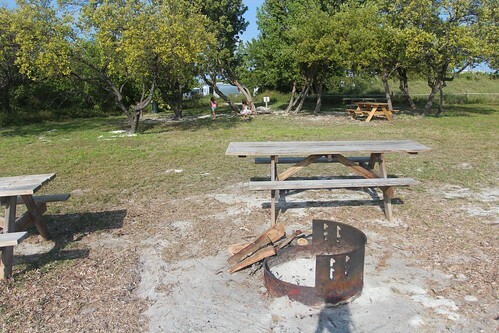 Even though these sites have BBQ grills, camp fires are not allowed. 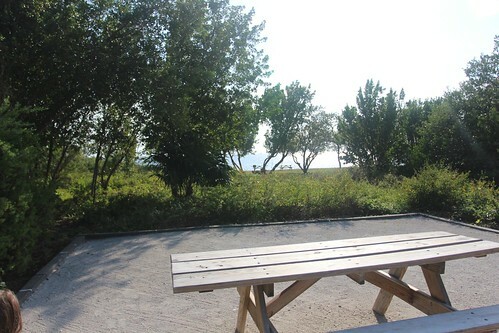 There is one fire pit down at the beach right near us that all the campers can share if they wished to have a fire in the evening. Because of that, no firewood is sold here either. People who bring wood will generally leave them by the communal fire pit so some is usually there for others to use. The nicest thing about Curry Hammock for us is that there is a playground right next to the campground. 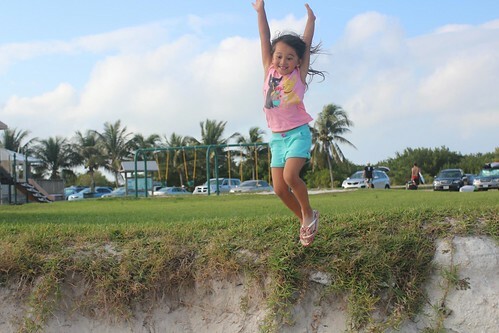 None of the other state parks have it and the girls are thrilled to have something else to do besides lounging at the beach. I know, it is rough. 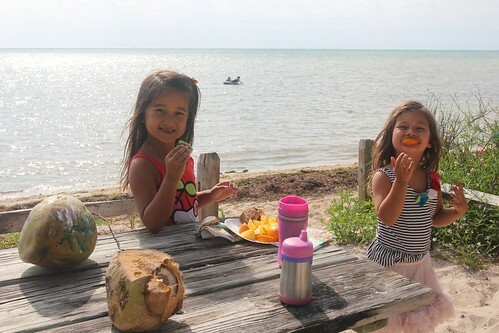 This is our 17th day in the keys and I don’t think anyone is getting tired of being here yet. It might be making us a little nuts but that is totally normal. So they say. 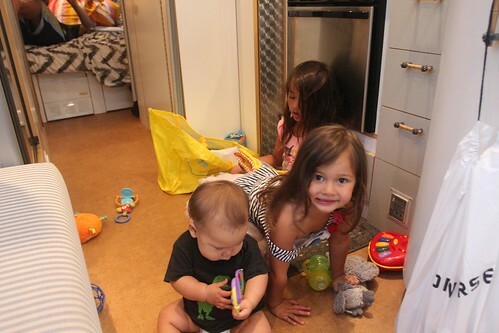 With all of the exciting things and big spaces to play outside, at some point the kids still prefer to be inside the Mish with their toys. With so much of the country in cold weather, I am sure not much sympathy will be felt when I say that it was getting a little hot for us outside. Tomorrow, more of the same. Day 145: Christmas morning in the Keys.